The 2019 BMW 3 Series has been given a modern-day makeover by the friendly German engineers at BMW. The size of this sedan has been increased to more comfortably seat your passengers and stow gear away. This sporty compact sedan is brimming with modern technology, advanced safety equipment and superior comfort amenities. Sterling BMW holds the distinction of being the best-rated BMW dealer in OC. We offer exceptional deals on 2019 BMW 3 Series leases in Orange County and near Irvine, CA. Stop by and visit us – we’re open seven-days a week - and allow our experienced sales team to tell you about our 2019 BMW 3 Series lease specials in Newport Beach, CA. You will not find better options or availability on a 2019 BMW 3 Series lease than right here at your friendly neighborhood BMW dealer. 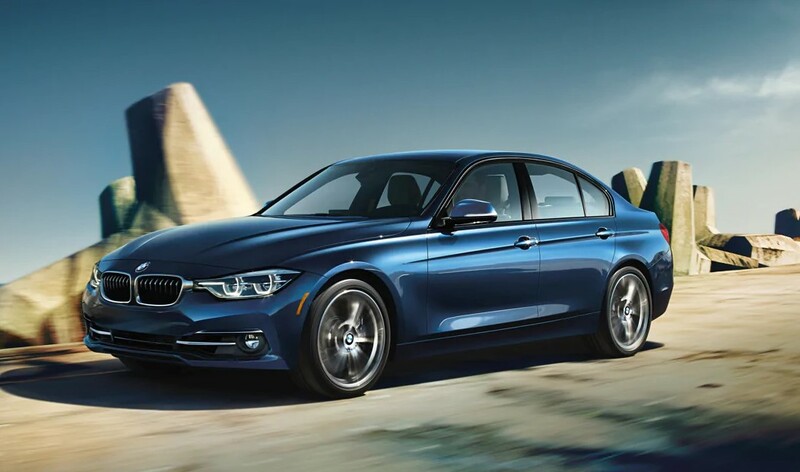 One thing you should do before you lease a 2019 BMW 3 Series in Newport Beach, CA is to familiarize yourself with all the standard features on this well-put-together compact sedan. Each of these stellar sedans includes SensaTec upholstery that’s complete with satin silver matte trim. The cabin air remains clean and comfortable, thanks to the inclusion of automatic climate control with automatic air recirculation and a micro air filter. Advanced technology is well represented with an iDrive system on-board computer that features a 6.5-inch center touch screen display. Your sedan will include such standard safety features as a rearview camera, tire pressure monitoring, programmable LED daytime running lights and BMW Assist eCall™. As Sterling BMW is the highest-rated BMW center in OC on major review sites, there is no need to look any further to find your new and improved 2019 BMW 3 Series in Orange County, CA. When it comes to power and performance, the 2019 BMW 3 Series has it in spades. This starts under the hood with the robust 2.0-liter BMW TwinPower Turbo inline four-cylinder, 16-valve engine. This dynamo engine achieves up to an impressive 180 horsepower and 200 lb.-ft. of torque. A bit more get-up-and-go is provided on the 2.0-liter BMW TwinPower Turbo, four-cylinder engine that generates up to 248 horsepower and 258 lb.-ft. of torque. This brings us to the raciest of them all, the 3.0-liter TwinTurbo inline, six-cylinder that effortlessly cranks out up to a healthy 320 horsepower and 332 lb.-ft. of torque. All these excellent engines pair with an eight-speed Sport Automatic transmission that includes both manual and sports shift modes. The exceptional sales team is standing by, ready to put you behind the wheel of your very own refreshed and ready to roll, 2019 BMW 3 Series in Newport Beach, CA.